Cafe Collective is a group of cafes in Siem Reap that have begun working together to help support a better future for the industry. The Little Red Fox Espresso, Sister Srey Cafe, Bang Bang Bakery-Cafe, Brother Bong Cafe & Footprint Cafes have been spending time together and have now launched their first initiative. 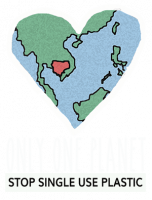 Inspired by the Plastic Free Cambodia movement, the Collective is looking to bring awareness of how long single use plastic takeaway coffee options exist on our beautiful planet. So far, the response has been largely positive, and the Collective has grown to include other cafes such as CRANE Siem Reap, The Missing Socks Laundry Cafe, Bayon Pastry School Coffee Shop, The Glasshouse Deli. Patisserie at Park Hyatt Siem Reap & New Leaf. What do you think? Would you be willing to pay a little extra for take-away packaging, or happy to receive a discount for bringing your own cup?